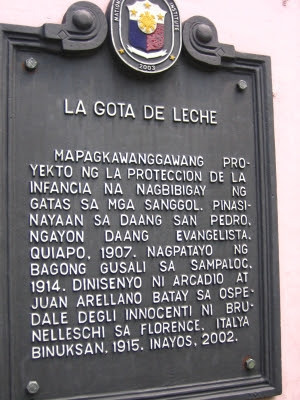 After the FEU tour, the group went, on Tutubi's suggestion, to Gota de Leche by crossing Nicanor Reyes St (formerly Morayta) passed by FEU gym and right turn to SH Loyola. 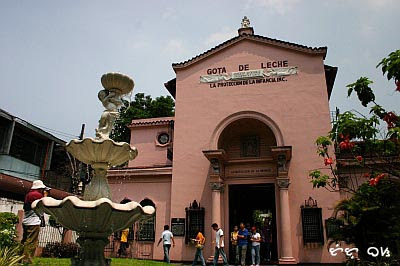 Gota de Leche, which means "drop of milk," was modeled after the Ospedale degli Innocenti, an orphanage in Florence created by Brunelleschi, a renowned Renaissance architect. 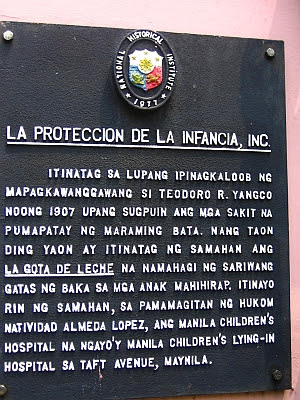 Constructed in 1917, the building has been the home of La Proteccion de la Infancia, a charitable organization providing free pediatric care and food to poor "people in the neighborhood" of which Manila has so many of. 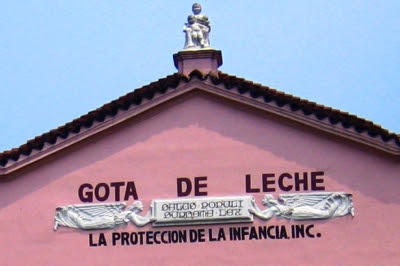 On the facade of the building are two relief carvings of angels and the words Salus Populi Supremo Lex, familiar Latin words from Cicero's De Legibus meaning "the health of the people is the supreme law"
this says "charitable prject of La Proteccion de la Infancia giving milk to babies. Inaugurated on San Pedro St., now Evangelista in Quiapo, 1907. Built a new building in Sampaloc, 1914. Designed by Arcadio and Juan Areallano based on Ospedale Degli Innocenti by Brunelleschi in Florence, Italy. Opened, 1915. Restored, 2002"
It's for this outstanding work of restoration and adaptive re-use that UNESCO awarded Gota de Leche the prestigious Asia-Pacific Heritage Conservation award in 2003. 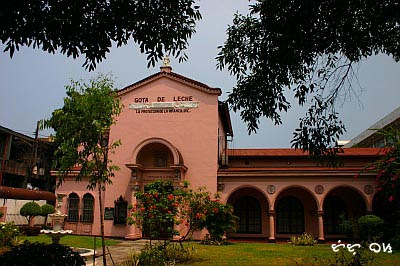 Other winners of this award were Far Eastern University and Nielson Tower (now Filipinas Heritage Library). the staircase is what i love best in gota de leche. 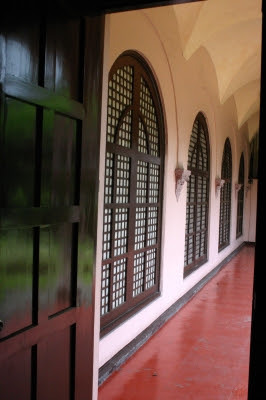 I love the photo of the corridor. Wonderful! Compassion for the masses immortalized through the building and those continuing the work. I hope I will see this place also in real lfe.